Never let unsavory weather conditions affect your ability to play golf. 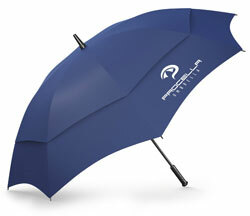 Whether you’re faced with a bit of rain or high winds, a golf umbrella is there to keep you protected. These umbrellas differ from standard umbrellas. They’re carefully designed to protect you from harsh conditions on an open course. While you may decide to simply pack a normal umbrella as you hit the course, you’ll quickly find out that it just won’t do. 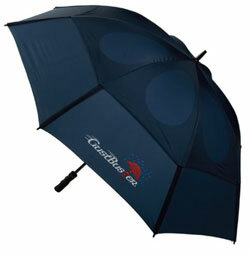 Golf umbrellas are made with golfers in mind. They are generally much larger, providing more coverage underneath. This is crucial when you’re lugging around heavy equipment. These umbrellas are also made to survive harsh winds. On a stretch of uninterrupted land, the wind can hit you hard. Many golf umbrellas are made to be wind-resistant, ensuring that they don’t turn in on themselves as you make your way through the course. There are a number of choices available ranging from simple options to those packed with features. Here are some of the best wind-resistant golf umbrellas available today. This option from GustBuster is used by many golfing professionals due to its durability and effectiveness. It is quite large. The 62-inch diameter canopy provides coverage for two people. It also uses a double canopy design. This adds strength and flexibility. The solid framework underneath flexes with the wind so that the umbrella keeps its shape. In fact, it’s been tested to withstand over 55 MPH winds. The shaft is made from lightweight fiberglass material and is finished off with a rubber handle. It comes in a few muted colors and has a lifetime warranty, ensuring you’ll never be without it. If you want maximum coverage, this umbrella is a great option. It has a diameter of 68 inches and can protect 3 or more people, making it a great option for families. Alternatively, it can provide more than enough protection to a single person and all their gear. The canopy is made from a strong nylon fabric while the shaft is made of fiberglass. The ribbing is also made from fiberglass, which adds to its strength during intense winds. The handle is made from comfortable rubber. It comes in a variety of two-tone color schemes and includes a matching sleeve to protect it when the sky is clear. 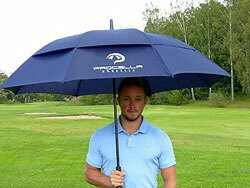 From Procella comes this incredible golf umbrella. It packs in a number of useful features, making it highly sought after by many golfers. The canopy measures 62 inches in diameter when opened, providing more than enough coverage. It uses a double canopy design. Not only that, but the double canopy incorporates mesh to vent the air through the umbrella. This makes it very resilient even in the toughest winds. The carbon fiber body is strong, yet light. It has a comfortable handle and single-hand opening system, allowing you to get covered fast. While it is a bit more expensive than other options, the great features make it worth the investment. This option from GustBuster is a bit smaller than their previous offering, but still packs a lot of great features. With a diameter of 48 inches, the nylon double canopy can cover a single person and gear. It’s opened with a unique pinchless system. 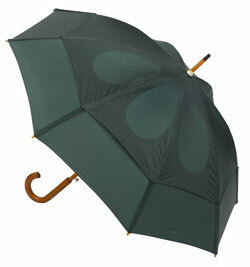 This system eliminates that ineffective way of opening standard umbrellas, allowing you to open it comfortably. The fiberglass shaft is double reinforced, ensuring maximum strength and lightning protection. The fiberglass material is tested to withstand gusts of over 55 MPH without breaking or inverting. It comes in many colors, allowing you to choose one that suits your style. This umbrella has an oversized canopy made of a unique fabric that offers different forms of protection. It is made by Minowl. The canopy measured 62 inches in diameter. It has a double canopy with a vent to let the wind pass through. The material used is micro-weave fabric derived from silk. It’s ultra water resistant, mold resistant, and even has over 50 SPF of sun protection. On top of that, it’s light in weight and very fast to dry. The shaft and canopy frame are made from hardened steel. It will last a lifetime and not buckle under harsh winds. If you want something with a bit of stylish flair that also holds well against wind and rain, look no further than this option from Atree. It is a durable umbrella that uses two layers of solid pongee fabric to protect you from rain. It measured 56 inches in diameter. The shaft and frame are made from flexible fiberglass, making it very wind resistant. The handle is straight and simple but uses a comfortable foam that is soft to the touch. It comes in a few vibrant colors, making it an attractive option for any golfer. 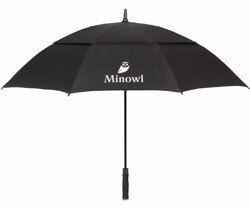 This is an effective golf umbrella with classic style. It has a retro dual-tone pattern on the canopy that features alternating panels of navy blue and white. The fabric used is light, durable, and water resistant. On top of the canopy is a plastic tip that lets you secure the umbrella to the ground as you make a shot. The shaft and ribs that hold the canopy are made from fiberglass. A wooden handle offers a timeless look. 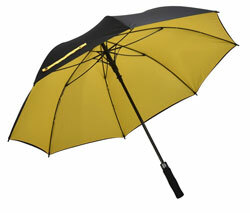 Overall, the umbrella is flexible enough to withstand some harsh winds and large enough to cover you from rain. With a great price, it’s a suitable option for hitting the course. When you’re on the lookout for a quality umbrella, there are a number of things to consider. These umbrellas are made to protect on the golf course, so they contain special features you’ll need. While you may not realize these features are important now, they’ll prove to be beneficial when you need them most. When it is pouring out, having maximum coverage is a must. 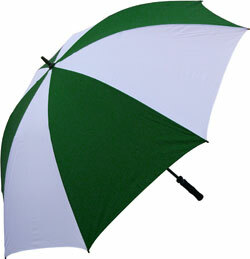 Golf umbrellas are usually considerably larger with a diameter of around 60 inches. This large size provides protection for your gear or a golfing companion. Others have a sloped design. This unique shape not only provides more protection, but actually helps you avoid getting wet by cleverly diverting water as far away from the handle as possible. 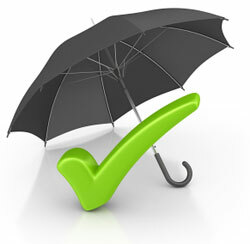 The material of the umbrella is an important thing to consider because of weight. 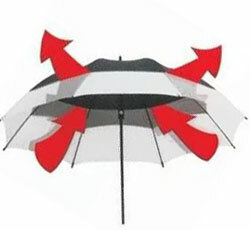 You want to have lighter materials so that the umbrella doesn’t become cumbersome on the course. Options often include fiberglass handles and shafts. Fiberglass is very light, yet incredibly strong. It rivals standard metal shafts because of its strength and durability. It’s also a good material in terms of safety. Should you ever find yourself caught up in a lightning storm in the middle of a sprawling course, you’ll be glad you went with fiberglass. It won’t attract lighting like a long metal umbrella. The materials of the canopy are also important. You want to go with something that is light and flexible. A thick material will only weigh you down and become hard to use when rain strikes. That being said, something too thin won’t hold up. The wind is often overlooked when shopping for umbrellas. Harsh winds can throw your umbrella around, causing it to invert or go flying out of your hands. If that happens, the umbrella is completely useless. Wind resistant umbrellas are heavily tested against severe winds. In fact, many test against hurricane force winds. While it is highly unlikely you’ll ever play in a hurricane, you can rest assured that the umbrella is more than strong enough to withstand some rain and wind. 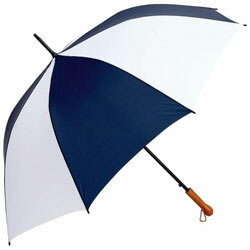 To make the umbrella resistant against wind, manufacturers may use a number of methods. They may incorporate strong components to prevent the canopy from inverting or even use a completely innovating design. Sloped canopies direct the flow of air over the canopy while ventilated options allow it to pass through safely. Either way, it’s important to look for something that’s been tested and designed for the wind. Extra features can make owning and using a golf umbrella a breeze. 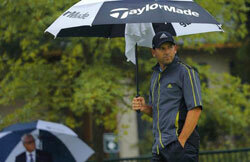 Plastic tips are commonly used in golf umbrellas for those who don’t have a caddy. They can stick directly into the ground to stay put while you take your shot. Manufacturers may also choose to go above and beyond with handle design. Foam and intricately designed contours are often used to make them comfortable to hold for prolonged periods of time. 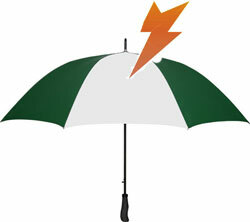 Essentially, you’ll want to look for any extra features that may enhance your use of the umbrella.